G.A.Henty was a masterful storyteller who lived from 1832-1902. Read what my 15 year old writes about G.A.Henty. George Alfred Henty was an exceptional historical fiction story teller. His stories were always about strong, hardworking, trustworthy and loyal young men, mostly coming from an English perspective. Henty used historical fiction to show the English perspective in different battles. For example, in the "Tiger of Mysor," Henty shows the, 'right' English way in the conquest of India. He uses his writing talent in the books, 'By Pike and Dyke,' and 'By England's Aid' to show what the British thought of the Spanish control of the Netherlands. Henty had good morals. In the book called, 'At Cressy And Poiters,' Walter the hero of the book knocked down his opponent, in the city games, but Ralph, just commended him on his skill. Later in the book Ralph became Walter's servant, and he remained loyal. In, 'One by the Sword,' Hector is brave and courageous, as he strives to communicate with the fortress, while it was being besieged. Henty's characters always fight for a good cause. In, 'A March on London,' Edgar fights to protect a man from a band of ruffians. In, 'A Knight of the White Cross,' Sir Gervaise destroys a huge pirate fleet single handed, so that the coast of Italy would not be ravaged. Henty is now called the Prince of Historical Story-Telling because of his masterly talent in creating a vivid description of English battles. Why should we read his novels? The essay below describes what my eldest son likes about Henty's books. Henty's writings really spring alive and encourage you to turn the next page. There are several reasons for this quickness and cleverness in writing and the first of those reasons is that Henty had real life experience in war. The second reason is that Henty had a strong belief in doing what was right and courageous and believed in helping those in need, and standing up for women. Thirdly, Henty was a strong patriot and in his book, he condemns a traitor and exalts those that remained firm to their country. All of these great aspects can be seen throughout his novel and that is what makes his books such a pleasure to read. In Henty's novels, there is stunning realism and amazing truth to his battles. The amount of research that Henty would have had to do would be immense. As a hospital commissariat in the Crimean War, he witnessed the heroes and the stark reality of the battle. 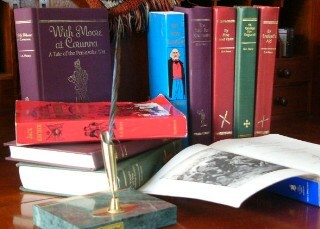 In some of his books, he displays knowledge of someone who was present. For example, G. A. Henty was present at the Crimean War (as hosptial commissariat), the Austro-Italian War where he met Garibaldi, the British expedition to Abyssinia, the Franco-Prussian War, the Ashanti War, the Carlist Rebellion in Spain and the Turco-Serbian War. He served as Special Correspondent for "The Standard" newspaper in both Magdala and Coomassie and many other war zones. As a newspaper correspondent, he traveled down the coast of Africa and up the Volta River to join the British expedition against the Ashantees with Henry M. Stanley reporting for the New York Herald. He was also there for the opening of Suez Canal and had been to Palestine, India and Russia. From all of these experiences and all of these visits to different countries, it is no wonder why Henty's novels are so good. They are full of danger and perils of war and are very exciting and a number of the characters he describes in the book he has even met, such as Garibaldi. It is obvious to a reader of Henty's books that G. A. Henty believed thoroughly in a man being strong and courageous, chivalrous and a defender of women. Even in his own life, G. A. Henty has been known to have beaten down a Spaniard in a duel who had been so rude as to insult the Queen. In Italy, Henty beat off four bandits and he also defended his wife from an insulter. Henty had a dangerous job as a war correspondent and he had to sometimes come and go in disguise. From duels, to bandits, to defending a woman, and to going in disguise, Henty's life was full of adventure. All of these kinds of adventures and more can be seen in Henty's novels. Henty would generally create a character who was about the age of 16. Each character would have different traits but many were similar. For example, most of his characters were chivalrous, intelligent, fit and strong beyond their normal age, courageous, modest, humble, and with plenty of heart. The character Henty creates is a boy and a son that every parent dreams for. Thirdly, Henty's novels are all patriotic books. In every single book, the hero will never become a traitor or give up his patriotism. His books would glorify a patriot and condemn a traitor. In many of his books the worst character would be a traitor. In the many books he has written, it is seldom that the man is not patriotic towards his own homeland. This aspect definitely adds to the books and makes them easier to read and enjoy. The character will be worthy and the book comes alive with interest. The paragraphs above show how G. A. Henty's books are so interesting. In every way they come alive whether it be by Henty's own experiences in the war, or his chivalrous actions, or even his patriotic heart. The books that G. A. Henty have written are great books in which the writing comes alive and the reader is engaged. G. A. Henty's books are enjoyed universally now, and will be enjoyed by future generations. Landmark series by Random House.